NIMD extends its congratulations to the Colombian government and the Revolutionary Armed Forces of Colombia (FARC) for reaching a historic peace accord. After four years of negotiations, both sides have agreed to work together to build a stable and enduring peace in the country. NIMD will assist in the process of ensuring a successful implementation of these peace agreements by facilitating interparty dialogue, strengthening political parties’ policy-making skills, and enhancing democratic values. Read our full press release here. 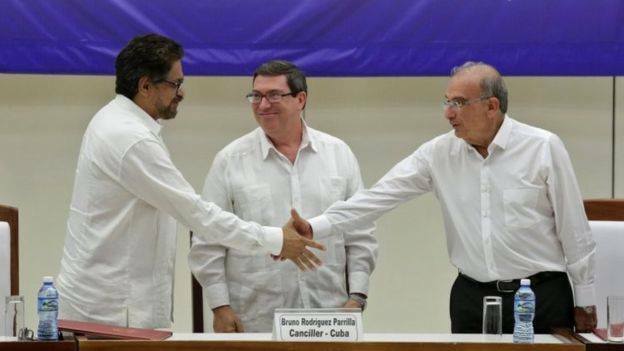 Picture: Colombian government negotiator Humberto de la Calle (right) and his Farc counterpart Ivan Marquez (left) signed the agreement as Cuban Foreign Minister Bruno Rodriguez watched. Update 01/12/16: The initial peace accord was unexpectedly defeated in an October 2 referendum. However, on 30 November 2016, Colombia’s Congress approved a revised accord, which was then signed by President Juan Manuel Santos and rebel leader Rodrigo Londoño. NIMD would like to congratulate the Colombian government and FARC for reaching an agreement on the revised peace deal, and we look forward to assisting in the process.